Young Adults … here’s an idea that has your name written all over it!! Teens and ‘more seasoned’ adults – listen in too! Small group faith sharing is my passion! It is how God drew me closer to him and the Catholic faith in 2005; and it is how he continues to keep me close over 10 years later. First as a shy, even overwhelmed attendee, and now as a enthusiastic facilitator! Small group community is a gift! There is accountability – which is so important in keeping us regularly connected to God, His Word and Church. How easy to get wrapped up in the day to day and forget to we are also spiritual creatures. In addition, shared experiences of faith help us not to feel alone; and not only bond the group but empower it to go beyond ourselves to serve God in his people. God has given us so much – what are we to do with all of it? 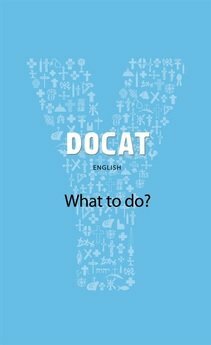 The new DOCAT (The Social Teaching of the Catholic Church) out now from the Ignatius Press – the same publisher that brought us the incredibly readable and engaging YOUCAT (Youth Catechism of the Catholic Church), draws on “Scripture, YOUCAT, the Catechism, and the Compendium of Catholic Social Teaching, DOCAT shows young people how to work toward building a “civilization of love“. 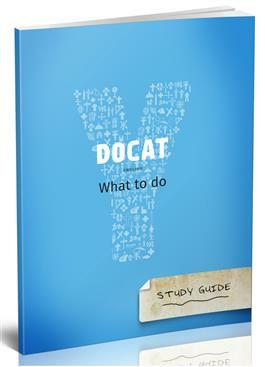 After being blessed with a copy from Ignatius Press to review; I was immediately excited to consider the wonderful opportunity the DOCAT along with the fantabulous Study Guide provides for Young Adults seeking rich material to come together with. As I speak with many young adults in my ministry; it is clear there is no lack of desire to meet and serve. What seems to be a stumbling block is what to offer. DOCAT study groups can be the answer – and not just for 20 and 30 somethings; this rich resource can be inspiration for Confirmation; RCIA and Parish Study Groups as well! Format – so engaging and easy to use. Read; Respond; Reflect — then jump into the Scriptures; Chat and BE CHALLENGED! New Media – this stuff is super relevant. **See DOCAT App info below! Plenty of room for notes and lots of great ideas on what to contemplate in those notes! For more on the DOCAT check out this marvelous 8-page information packet from Ignatius Press! For even MORE fun… check out the DOCAT App!